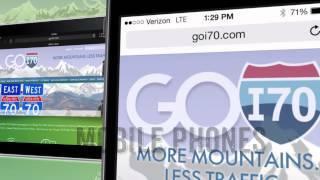 GOI70.com, a project of the I-70 Coalition, helps travelers plan a delay-free trip along the I-70 mountain corridor. The website was originally created in 2009, but Margaret approached Imagine That in May of 2013 with the hopes of creating a brand new site that brings together all of the I-70 travel resources into one place. Additionally, the coalition stressed the importance of an “on the go” capability, so we integrated a responsive design for mobile and tablet applications that feature real-time text and email alerts. With just a little planning you can have More mountains and Less traffic. With that in mind, our talented team of designers created a custom website that incorporated a “one-stop shop” functionality so that travelers can have all the information needed at their fingertips to plan a delay-free trip along the I-70 mountain corridor. With a “stress-free” look and feel, the design of GOI70.com is user-friendly and relevant. At any time, one can find the latest road information, traffic forecasts and tips, I-70 news and carpool and parking services. In today’s information-rich society, the ability to access real-time road info was an absolute must for GOI70.com’s site redesign so we integrated a few different options to meet those needs. Responsive site design was a critical component to the revised GO I70 site, as we needed to create a consistent user experience across all devices and browsers. The site will rearrange to display the most relevant information depending on the device used, whether it is a phone, tablet, laptop or desktop. One can visit the website and download the CDOT Mobile App, or if one prefers to get their information via a mobile phone, you can sign up to receive up-to-date text and email alerts. While en route, these services can be invaluable to creating a stress-free trip. I-70 peak traffic is quite predictable and the best way to avoid traffic is to travel during off peak times. Armed with that knowledge, one of the most important features that we had to tackle was that of the Deal Database Integration. With the goal of enticing travelers to stick around longer or even to stay overnight on Sundays, Imagine That created a database for companies to submit special deals in hopes of persuading travelers to stick around and avoid the traffic. Service deals include dining, lodging and recreation in Clear Creek County, Summit County, the Vail Valley, Winter Park and Central City/Black Hawk. Travelers just need to select their criteria and off they go into savings heaven. Imagine That has been working with the I-70 Coalition since 2013. We are proud to be part of the work they are doing to reduce congestion on the I-70 corridor.